Just the idea I need for all those lovely card stock notices and ads arriving throughout the election season. I have a stack of them waiting for a job. They will be great strong stiffeners for these News Paper bags. Love it, I'm definitely bookmarking this one!! Another great way to recycle, you can use old square hay bale twine for the handles. Just cut 2 same lengths of bale twine tie a knot at each end and singe ends with a lighter so they don't fray. You can still put them thru the punch holes or staple them to the top of each wide ends of the bag. These ideas are too good not to share! I love this...thank you so much! Thanks. This worked great. I used brown paper that I already had to make a large bag for a baby shower gift. Thank you for sharing, I will be making these for putting my Easter eggs in and other Easter treats to give to family members, what a fab use of the Saturday and Sunday paper! Always looking for creative packaging ideas and this one is fantastic! I just 'stumbled upon' your great tutorial. It looks like a fun way to recycle. Thanks for sharing. I LOVE this idea! I am very crafty and I WILL make some of these bags! Thank you very much! Thanks for creating such an amazing blog - I can't get enough! Thank you so much for sharing this! I have been looking for a pattern like this for quite a while. I loved making this gift bag. Thanks for sharing this awesome tutorial! Came across lots of these bags when I was in India,where they're routinely used. I was just thinking I'd like to be able to make some of my own so this is great! Thank you! awesome! Just making a gift bag for a handmade present, and this is the most informative gift bag how to i saw! I love the idea of making it from newspaper too they look so awesome and kitch! My mates gonna love em! Thanks for the post, trying one today. I just made this bag. Looks great & I love not spending money on wrapping. Thanks for the instructions! Loved this. 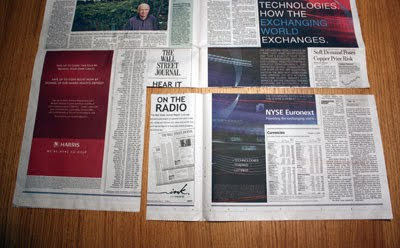 Turned out awesome and was really useful for the piles of newspapers I just end up taking to the recycling center anyway. Thanks for sharing the great ideas! Has anyone said "calendar pages!!" yet?!?! This is so exciting. I love when people have really great ideas AND they share with others how to put it together in easy to follow instructions! Cool idea! We made these from your instructions during an "Etsy Craft Community" Party at Creative Outlet Studios in Costa Mesa, CA, in June this year. Thank you for the tutorial- now to make more :) these are awesome bags! I shot through all the comments already left very quickly but didn't see anything about using pages from those store brochures you don't need. Heavier and glossy, this material makes cardboard liners unnecessary. 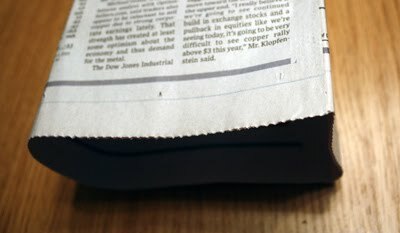 I just use regular paper folded in the bottom and it works fine. Super easy project. All we need is a spark, right? this is a great tutorial. i read it through at first and thought "what? there must be some missing steps or something" but then I went ahead and tried it, and following it as I did the steps made perfect sense! it was my aunt and uncle's anniversary yesterday so we made the bag using their favourite newspaper which we bought on the day! so this was awesome. thanks! 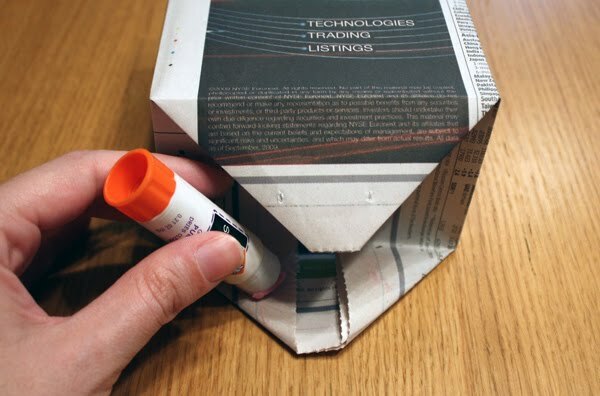 What a fantastic and easy way to make a bag. You could use anything be it magazine or newspaper like you have done. Thank you for sharing this idea with us all. Thank you. I will definitely going to try this. Wow what a really interesting article. 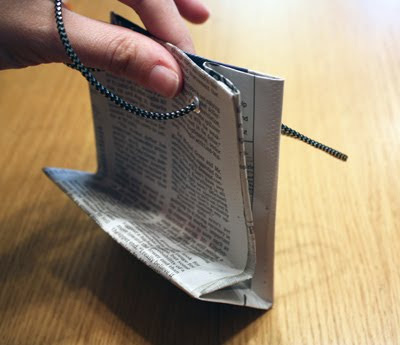 I love the newspaper idea it really is ingenious. Thanks so much for making this because i have a competition and i could really use this!!! OMG....I've bought bags and unglued them to try and use them as a template to make gift bags for my students with extra school newspapers. Ya, the only thing that got 'unglued' was me! I gave up! I'm so excited to have found your blog. I'm going to make a template with card stock and just use the thin VENOM RUBBER GLOVES (painting department) from Lowe's to avoid the newsprint smearing on my hands. My step dad used to run the Sacramento Union newspaper and his bday is coming soon. He will LOVE this! 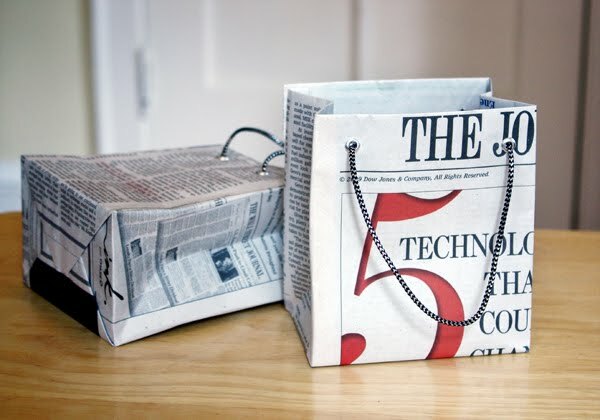 Great gift bags and wrapping paper theme, especially for the people who work at your local paper office:)Thanks!